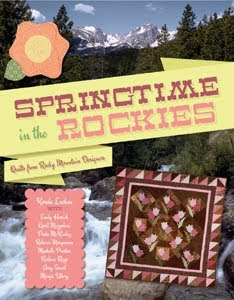 It is with great pleasure that I have an oppurtunity to share my pattern in the new book, Spring time in the Rockies. I had so much fun designing this quilt. When I am in the moutains I can see stepping stones as you walk through the new blooms of Spring. I am giving a book away in a drawing. Post a comment about your favorite spring memory. I know that is Fall. But spring will be in bloom before we know it. Keep checking in and I will be giving away some new cookies from Moda. Awesome Job! Can't wait to get my copy and get all the designers to autograph my copy for me! I love your quilt design. I think my favorite spring memory is when the crocuses bloom and I now it may be before spring actually arrives but that signals spring to me. My favorite Spring memory is remembering how we would celebrate Easter with my hubby's family. There was always a huge picnic at the lake and the whole family (extended and all) gathered together. Grandma is gone now, so we hold on to our precious memories of sweet times together. My favorite spring memory is when the first flowers start to bloom. It just makes me happy with all of the flowers. Cute quilt you made. My favorite spring memory: one spring we had a very wet spring and there were many creeks in the area that flooded and crossed the roads for days on end. My grandfather took me out in the county to see all of the water...and we caught baby fish, only about an inch long, swimming across the road! My springtime memory would be the wedding that took place in a chapel outside in Nevada. That would be a marriage to my husband that has lasted for 25 years and still we are together. Your picture is a great contribution to this book and I would feel honored to win it. Thank you for the chance to win. A lot of hard work and time went into this book and would make any winner happy to win. A favorite spring memory is traveling to my grandmother's house for Easter and getting to see all my cousins. Going to my grandmother's house in Michigan and smelling the lilacs! My memory goes back to when I was a child and got a pair of really cute rubber boots and a new spring jacket. I was sooooo excited on that Saturday spring day to splash in the puddles. Every year that I can remember, I have been a part of planning our gardens. And how much should be planted of what plants and why. I love it. Just getting my hands in the dirt knowing what will be growing is exhilirating. I love Sprintime in Michigan! Easter w/ the crocus blooming and sometimes a bit of snow - but always fun Spring events - Easter, my kids birthdays and planning our garden - apple trees in bloom! love it! When my son was little I loved his excitement over finding his Easter basket. Sweet.